I’m thinking of limiting the next sea surface temperature model-data comparison to the last 20 years. Much to my surprise, a blogger, hiding behind the name WebHubTelescope (@WHUT) , called me a liar in a follow-up comment here. I know how to use the NOAA NOMAD3 server too, so I have to ask: Is Tisdale a liar? It looks like approximately 0.1C warming per decade, about what one would expect for a 3C ECS where half the heat is being sequestered into deeper waters. What’s wrong with Manacker, doesn’t he know how to fact check? 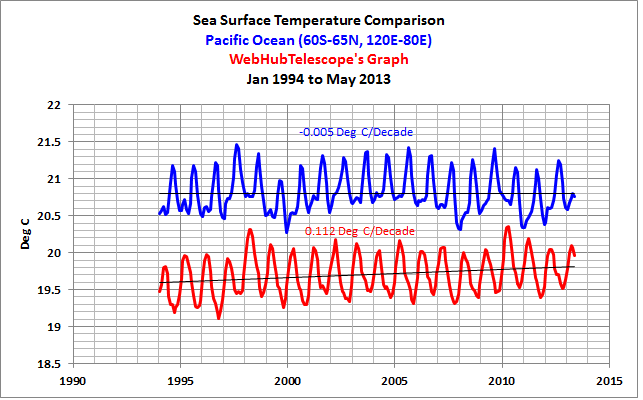 The problems with the graph that blogger linked: The sea surface temperatures are obviously too cool and there’s a positive trend that doesn’t exist in the sea surface temperatures of the Pacific Ocean since January 1994. I think it is you that is not listening Cappy. Yes, the ocean is retaining 1/2 the excess heat from GHGs, and the SST’s are rising at about 1/2 the rate as the land temperatures are. So we get hotter temperatures where people live and sea level rise from thermal expansion in coastal areas where people live. Is that what has gotten climate observers concerned? Note that Tisdale is a fabricator and data manipulator par excellence. The actual values are not as far from the predictions as Tisdale is fudging them out to be. That blogger went to a lot of trouble with overlays, etc., only to prove that he or she did not know how to use the NOAA NOMADS system—or the blogger was intentionally misleading his or her readers. Before you call someone a liar, WebHubTelescope, you should make sure you know how to use the tool you only believe you know how to use. Apparently you haven’t a clue how to use the NOAA NOMADS system. I presented anomalies and you presented absolutes. That was the first hint that you’re clueless. The anomalies selection is in the “Field” drop-down menu. Second, I presented the sea surface temperature anomalies for the Pacific Ocean using the coordinates of 60S-65N, 120E-80W. Are you aware that 60S is input as a negative number (-60) in the left-hand field for latitude and 65N is input as a positive number (65) in the right? Are you aware that second number in the longitude field has to be greater than the one in the left, so that those longitudes are input as 120 in the left-hand field and 280 in the right-hand field? Apparently not. And don’t forget to have January 1994 as the start month and year. Since you insist on discussing sea surface temperatures, here’s a comparison of the data you presented versus the sea surface temperature data for the Pacific Ocean if you had entered the fields correctly. Can you see the difference, WebHubTelescope? All you’ve managed to do is illustrate for all who view this thread now and in the future that you, WebHubTelescope, are incompetent or that you are the “liar”, “fabricator and data manipulator par excellence”. BTW, I don’t like being called a liar by someone who’s incompetent. And if you’re not aware, people who are competent have been checking my graphs for years and this is the first time that anyone has ever said that I’m a “liar”, a “fabricator and data manipulator par excellence”. I shouldn’t have qualified my one statement with “by someone who’s incompetent”, because I wouldn’t like to be called a liar by a competent person either. Then again, if I make a mistake, I acknowledge it and correct it. But the mistake in this case was not mine. indicates the data is for the coordinates of 60S-65N, 80W-120E. In other words, WebHubTelescope presented the average sea surface temperature data for the Atlantic and Indian Oceans, not the Pacific Ocean. Also keep in mind that WebHubTelescope had to manually enter the coordinates in the title block—they do not fill in automatically. …everyone can see that you’re presenting the data for the Atlantic and Indian Oceans. You’ve entered the coordinates of 60S-65N, 80W-120E, not 60S-65N, 120E-80W. Yup, you’ve proven you’re either incompetent or intentionally misleading your readers. But we see that all the time with AGW proponents. With NOMADS, entering the coordinates of the Pacific Ocean requires a little forethought because they cross the dateline. The longitudes for the Pacific Ocean (120E-80W) can be entered two ways: 120 in the first field and 280 in the second. The second way is to enter -240 in the first field and -80 in the second. But the value of the coordinate in the left-hand field must always be less than the value of the coordinate in the right one. Does anyone have any questions about how to use the NOAA NOMADS website for downloading the Reynolds OI.v2 sea surface temperature data? Maybe WebHubTelescope should have asked before making a fool of herself/himself. As you might suspect, I really do not like being called a “liar” or “fabricator and data manipulator par excellence” or being accused of “fudging” data. This is still about 0.1C per decade, about as predicted for 3C ECS. WeHubTelescope acknowledges making a mistake, but then comes right back again and misrepresents the data again. That is, WebHubTelescope, after being advised how to properly input the coordinates of the Pacific Ocean, presented the data for the global oceans minus the polar oceans (60S-60N, 180W-180E) and then claimed in the title block that the data was for the coordinates of the Pacific. And WebHubTelescope called me a “liar” and “fabricator and data manipulator par excellence”. This entry was posted in CAGW Proponent Arguments. Bookmark the permalink. I know you are a highly competent, impeccably HONEST, bona fide scientist, for I have read the respectful and affirming comments of the many reputable, brilliant scientists on WUWT about your excellent posts there. Your research is thorough and accurate. Your replies to questions and comments prove your integrity and expertise. Yeah, I agree. It’s one thing to be called a liar by someone who might possibly know that to be the case (even when it is not). It’s another to called a liar by an arrogant fool. “Stone is heavy and sand a burden, but provocation by a fool is heavier than them both.” Proverbs 27:3. While a fool shouldn’t be answered (lest she or he appear wise in his own eyes), you were right to refute him or her for the sake of those who might otherwise have been misled by her/his horrendous distortions of the facts. And…. “Like a fluttering sparrow or a darting swallow, an undeserved curse does not come to rest.” Proverbs 26:2. In the opinion of those who MATTER, your reputation is stellar. I have noted WebHubTelescope’s unwarranted hubris, typical of the academic AGW defenders on Judith Curry’s site, every time I have visited that site (increasingly infrequently) over the last 3 and 1/2 years. You have done a real service here, outing him as an incompetent poseur, and I only wish Curry would present your post here, on her blog, with perhaps her apologies for allowing his kind continuing safe harbor among the commenters at her site. To me, it is an indication of her inability to see the truth, even with overwhelming evidence, that she allows such fools to represent science on her site and to badmouth skeptics of the publically-promulgated, alarmist consensus. …oops, it’s only been 2 and 1/2 years, not 3 and 1/2, since I first visited Curry’s site, in Dec. 2010 (to inform her and her readers of my Venus/Earth temperatures comparison, that disproves the existence of the global-warming “greenhouse effect” and fundamentally corrects a whole handful of false beliefs among climate and atmospheric scientists). Bob, your work is a highly important for the skeptical community and the climate science and highly appreciated by many of us who want to trully understand and learn about climate. Don’t let yourself get too much bugged by such stupid remarks as WHUT did on Judith’s blog. It is great that you showed him the way and made it clear where the truth lies, but do not let it make too much bad blood. Among reasonable people, if WebHubTelescope’s ad hominem commentary didn’t automatically discredit him/her, your sound, sourced facts certainly did. Kudos, Mr. Tisdale. It is generally not nice being called a liar, but when it comes from someone like Web, a true believer, you know you have hit a never. You can’t reason with the irrational, so don’t let the Thermogeddonists get you down and stop you visiting Judy’s place. When you’re taking that much flak Bob, you know you’re getting pretty close to the target! WHT often comes across that way. I usually, but not always, skip to the next comment at Judith Curry’s blog. Bob Tisdale is the sort of person who tries to draw attention to how somebody might misunderstand data he is presenting. Lesser people go the opposite direction, and give every impression of supreme overconfidence in their jargon-cluttered rants. At least you received somewhat of an apology! Imagine that! An Ad-Hom purveyor with a guilted edge!!! Webby used to wax eloquent and ignorant about Peak Orl and how we were in trouble. Haven’t been to Curry’s lately, but, maybe he was looking for a new subject to be a ” “liar” and “fabricator and data manipulator par excellence”.” upon. I have encountered WHUT several times and he always comes over as a bigot with a little bit of knowledge and a huge ego. I suppose that is true of many of the warmist hobgoblins who try and pretend they have a clue about climate physics. I say well done Bob for putting the ignorant, arrogant, man right. Unfortunately he will not have learned anything from this as he thinks in absolutes and is absolutely certain he is right even when he is wrong as he has shown here. In the meantime Bob let me say how much your salty contributions mean in our understanding of the wet parts of this Earth that have such an overweening effect on our environment. Good job. Just for your info, somone outed WHUT at Climate Etc as the idiot from Greenpeace of the “We know where you live” debacle (http://wattsupwiththat.com/2010/04/06/damage-control-greenpeace-removes-threats/). Best ignored. Jack C, thanks for the warning.